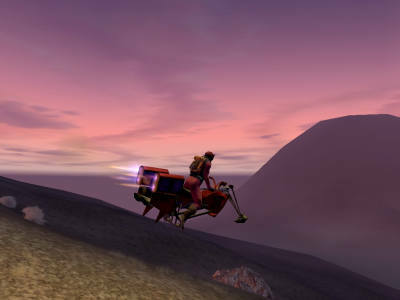 Staggering Stories - The Bibblethruster Guide To Starting Out In Star Wars Galaxies. The Bibblethruster Guide To Starting Out In Star Wars Galaxies. 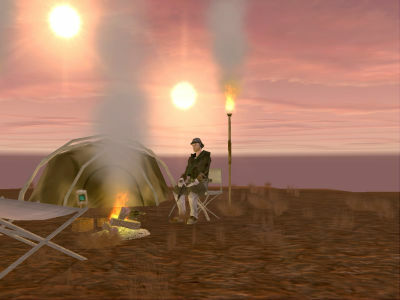 Tony Gallichan is immersed in the Massively Multiplayer Online Game: Star Wars Galaxies. Ok, well, firstly, welcome to the most addictive game I've ever played. Your in for a rollor coaster ride with this one, my friends, oh yes. Now this guide is a very subjective one. I can only really tell you what I have done, how I have gone about things. You might choose to take a different path as Adam has done, but hopefully you'll still be able to get some advice from this. As usual where I'm concerned, this won't be too long. Other wise I might have to start concentrating and remembering where I am in the thing and that simply won't do at all. Ok, so you start out in Mos Eisly, however it's spelt. At this stage you'll already have decided upon your character, Whatever profession you have chosen, GET A COMBAT PROFESSION ALSO. It's a bloody dangerous place out there. You can find a trainer for brawler or marksman around the town. At this stage it doesn't really matter how many professions you have as you have a good supply of skill points, so get yourself a novice medic skill and a novice entertainer skill also. Its only later on that you have to decide what speciality to go for when the skill points become scarce. Go outside the city and start to kill the small creatures you'll find there. Before too long you'll have gained a further combat skill which you can go back to the trainer to learn or you can find a player trainer, that is, another player of the game who is further along then you. It gives them apprentiship points to train you which they will need should they wish to gain a Masters in their chosen professions. You will notice something I like to refer to as "The Green Plague".This is your "Helper" Artoo unit. It's a pain in the arse, but it can help you along by giving you hints, tips and help as well as small, easy missions designed for your particular professions. Everybody gets one of these wretched things and it amuses me to see one thats been left behind out in the middle of the desert. Sorry, but you'll find the thing appears at the most inconvinient of moments. Next, find a mission terminal. These give out missions to players that are worth money and one gains experience points from doing the missions. Now, there are some which are specific to certain profs...Entertainer, Artisan etc, but if you want to build your combat skills then get a "Destroy" mission. You normally have to travel to a waypoint. As you approach it it will relocate to exactly where the mission iswhich normally means having to change course and go that little further. Once there, destroy the creatures or Non Player Charecters. Then attack the lair (or target, if its an NPC mission). A word of warning. When you attack a creature lair, more creatures are spawned and will immediately attack you as well as repair the lair. Take your time. Don't be afraid to back off and regenerate your HAM (Health, Action and Mind pools at the top left of your screen). Adam and I, when we were starting out, used to team up and once we spent about two and a half hours on one mission to destroy a beatle lair. We were forever running away and getting incapacitated. Note. If you get incapacitated, that is, if one of your three main HAM bars reaches zero, three times in ten minutes, you die. When you die you are cloned, either at the nearest cloning facility, or at the cloning facility you will have stored your clone data at. If you travel to another world, make sure you clone yourself at a facility on that planet or you will be automatically cloned there, but suffer a lot of damage and the items in your inventory will also be damaged. You'll start to earn money from these missions. The first thing I recommend you buy is transport. You can buy an X34 Landspeeder - the same type that Skywalker used in A New Hope (ok, in Star Wars), for around 6000 credits. These things might not be too fast, but it most definatly beats walking, and they are quite durable and need little repair. Then just keep doing the missions. It's called "Grinding". You might start to get a little bored just killing things, over and over. So why not sight see? If you press Control V you'll bring up the planetary map. On this to the right, you'll see a list of things like cities, shuttleports etc. This will give you a waypoint to such things. There is a list called "Places Of Interest". Have a look at it. 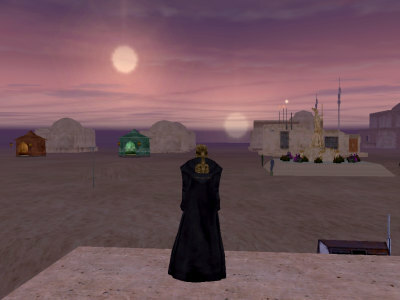 On Tatooine alone theres lots to go and see and you'll get a "badge" on your character sheet for all who examine it, to see. Also, depending on the badges you collect, they will; help towards becoming a Jedi. However, I'm not gonna go into that here, this is just for Newbies. There are also what are known as "Theme Parks" These are places that give out missions and as you complete these missions, you get a small reward and progress through the Park. At the end of it you'll get a badge. Fun to do, some can, however, be a little dull. Company is a wonderfull thing. The Staggering Stories team often team up and go out together to do "things". There's often people calling out for folk to come join their group. Doing this will give you bigger, more difficult missions which are worth more money. There's two kinds of groups : the normal one where you all go out together to complete the missions . You'll find you all manage to easily do the mission, working totgether, and you share the reward. Then there's the "Solo" Group. In this, you group up to get the better missions, then go off on your own to complete the two missions that you will have. Its certainly a lot harder, but you get the whole reward and all the the experience points. Now then, this is where myself and Purcell face are doing things differently. My advie to you, once you've been playing a short while, is this: Join a Guild. These are player organisations, some of which are Rebel, some Imperial and some neutral. They will give you people to talk to for advice, bargains on things you might want to buy, sometimes free buffs (more on that in a moment) and friendship. It's well worth doing. 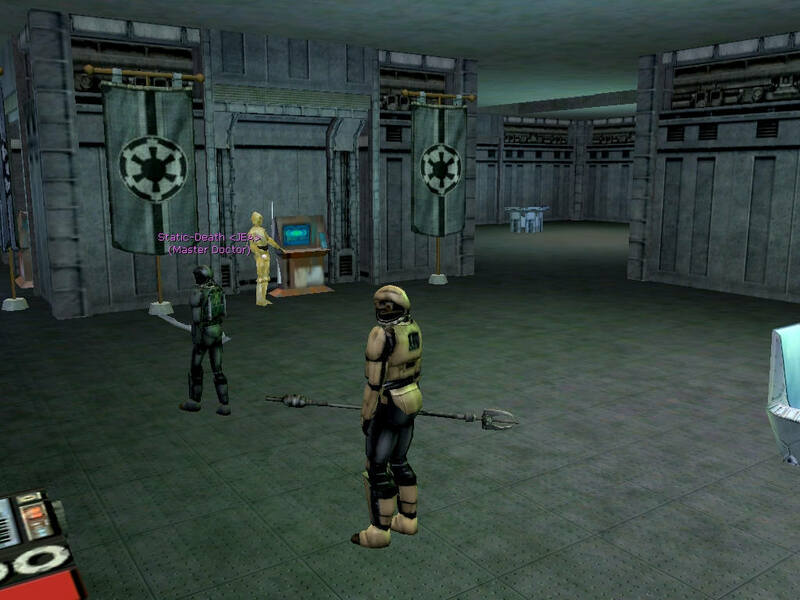 I myself am in the Jealhimet Elite Army, the biggest Rebel guild in the biggest Rebel town on the server. They are a great bunch of players, full of humour and kindness. Think your progressing too slowly in your combat professions? Then find a Master Doctor and ask him if he will "Buff" you. This is a temporary, but significant, increase in your stats. You may have to pay, normally around twelve thousand credits, but its worth it. You can then go to a place like the Squil Cave. Vicious creatures, your Squill, you know. I advise you go down there with a friend so you can watch each other's backs. Spend a while down there and you'll soon earn an awful lot of experience points. You can also buy food and drink that gives you buffs, however, the duration is considerably shorter then the two and a half to three hours you'll get off a doctor. When you kill an NPC, loot it. Just double click on the corpse of the NPC and you will normally get money. You might even get an item of some kind. This Loot can sometimes be worth an awfull lot of credits. On one Guild mission to kill Nightsisters on Dathomir, we looted an attatchement that was worth thirty million credits. I am now considerably richer then you. You''ll find that these loot items soon mount up and while you can place some in your bank deposit box which can normally be found in most towns, your gonna need more space. After all, you'll also have been buying better weapons and armour. 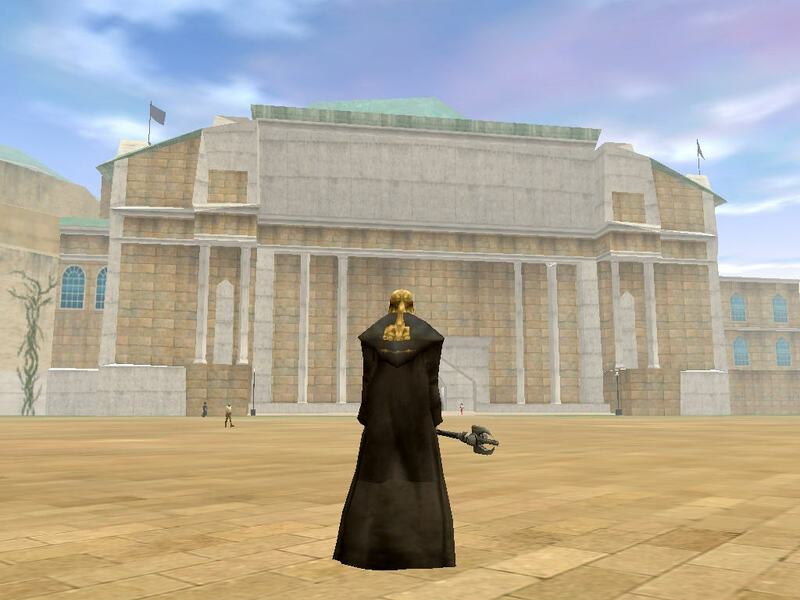 After that, just hang out with the guild, travel the galaxy, explore, grind your skills and most of all...Enjoy it. Feel free to come to Jealhimet on the Europa-Chimera server and chat to me. I'm happy to show newbies around. Look for Bibblethruster Macfadyan. I'm the drunk proping up the corner of the cantina.